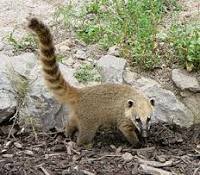 Coatis can by recognized by their long stripy, often risen tail. They have a long, pointed nose that helps them searching for small animals under the stones and wood. They are feeding on fruit as well. The males are solitary, the females are living with the young in larger groups.